Are you looking for distributors capable of developing your cured meat market? Do you want to highlight your innovative products? SIAL Paris will help you to meet buyers from all over the world and to raise your international profile. 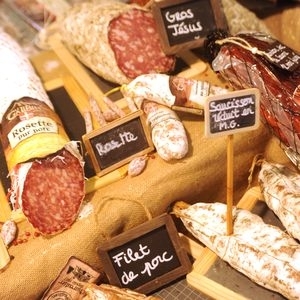 An exhaustive array of cured meats is exhibited at SIAL Paris: cooked ham, cured, ready-cooked cured meats, regional specialties, salted, smoked and/or dried meats, and more. The SIAL Innovation Observatory reveals the show’s innovative offering and analyses consumer trends. Seen by 7 visitors in 10! LOEUL ET PIRIOT’s 2 cuisses de lapin les éleveurs responsables (FRA): Rabbit cuts from responsible farms. French rabbit. Raised in large pens. Fed without GMOs. From the Bleu-Blanc-Coeur branch. Roast chicken fillet cut with a knife / LDC / LE GAULOIS cooked poultry meats (FRA): Easy-to-serve precut poultry. Who are the buyers who come especially for you at SIAL Paris? Who visits the Cured and Salted Meat sector? Aeon (JAP), Ahold (NLD), Albert Heijn (nld), Aldi (DEU), Amazon (USA), Auchan (FRA), Groupe Bigard (FRA), Carrefour (FRA), Casino (FRA), Costco (USA), Delhaize (BEL), Edeka (DEU), Auchan (FRA), Leclerc (FRA), Lidl International (DEU), Metro (DE), Rewe (DEU), Seven Food (JAP), Tesco (GBR), The Kroger (USA), Wal-Mart (USA), Coles (AUS), Woolworths (AUS). More than 6,500 mentions in the media (press/radio/TV) both in France and abroad. In addition to overall exhibition promotion, take advantage of sector-specific communication thanks to a large-scale media plan.